FIDEL! 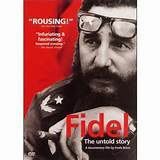 The Untold Story 6:30pm, Thursday, July 23Room 201, Halifax Central Library5440 Spring Garden RoadCome and see the acclaimed film, Fidel: The Untold Story by award winning film-maker Estela Bravo. Fidel Castro is one of the most influential figures of our time. Fidel: The Untold Story offers a unique opportunity to view the man through exclusive interviews with Fidel Castro himself, historians, public figures and close friends, with footage from the Cuban State archives. Juxtaposing the personal and anecdotal with the history of Cuban revolution and its fight to survive the post-Soviet period, Fidel: The Untold Story presents a new view of this powerful and compelling figure. Featured in the film are Nelson Mandela, Alice Walker, Harry Belafonte, Sydney Pollack discuss the personality of the man. Former and current US government figures including Arthur Schlesinger, Ramsey Clark, Wayne Smith, Congressman Charles Rangel and a former CIA agent offer political and historical perspectives on Castro and the long-standing US economic blockade against Cuba. Family members and close friends, including Nobel Prize-winning author Gabriel Garcia Marquez, offer a window into the personal life of Fidel. Organized by the Nova Scotia Cuba Association.